Your horse's skin and coat are vulnerable to the elements, as well as to irritations caused by tack. Equine shampoo and conditioner remove contaminants that could cause your horse discomfort. Many products are formulated to solve specific problems, so read the description carefully before purchasing. Always consult your veterinarian if you aren't sure whether a particular shampoo or conditioner is right for your horse. Avoid shampoo products intended for humans or other pets because your horse's skin acidity is different from yours or your dogs. Equine shampoo is formulated for the pH balance of equine skin, and is therefore less likely to cause irritation or loss of necessary oils. 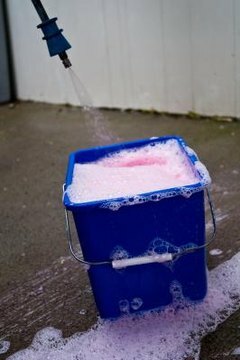 Consider a soap-based equine shampoo if your horse has sensitive skin. It will not be as harsh as a shampoo made of a detergent formula. If your horse has developed a fungal infection on his coat in the past, an anti-fungus shampoo might help to avoid a recurrence. Fungal infections result in hairless lesions on the coat, often along the legs and flanks. Never use an anti-fungus shampoo unless you have consulted your veterinarian. Fungal infections mimic the symptoms of bacterial infections, and you do not want to treat the coat incorrectly. Performance horses might benefit from color enhancement shampoo, especially before a competition. Some are designed to purify white hairs by eliminating any yellow or brown tinge, while others strengthen darker colors, such as a chestnut or true black coat. A whitening shampoo should be used only on areas with "chrome", such as blazes and stars on the face or snips and socks on the legs, if your horse is a different color on other areas of his body. A medicated shampoo treats skin disorders, such as those caused by bacteria or parasites, but should be used only after consulting a veterinarian. Many different types of skin disorders exist in horses, and treating the wrong ailment can worsen the condition. Some products might be irritating to human skin, and should be used only while wearing protective gloves. An equine conditioner formulated specifically as a detangler allows you to separate the hairs of the mane and tail, and easily remove knots. It also improves the health of the individual strands. You can use a detangling conditioner on the rest of the body, as well, but make sure to rinse it thoroughly from your horse's coat. Conditioner residue can irritate the skin. You can, however, leave it in for a few minutes to maximize the effect. Apply leave-in shampoos and conditioners between baths to keep your horse's coat, mane and tail healthy. Some are designed to add shine to the coat or to promote mane and tail growth, while others protect the skin and coat from UV damage. What Can I Use to Get Rid of My Horse's Mane Dandruff? What Is M-T-G for a Horse's Mane?